I recently placed an order to Syr Hobbs Wargames, and the package came in the mail yesterday. The box looked like it got some rough handling, but fortunately only one of the zombies I ordered was damaged. 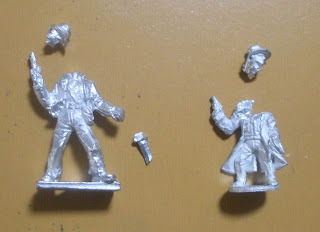 Included in the package were some of the 1/72 pulp horror miniatures produced by Elhiem Figures. I'll start the review with a couple of figures that I received in a previous order. First up is the icon of modern pulp adventure - Indiana Jones. 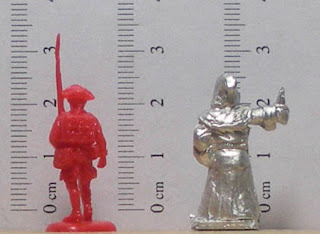 What line of pulp miniatures worth its name would ignore producing a not-Indiana Jones? 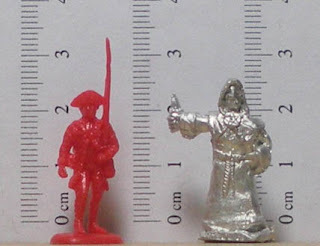 The first figure is Elhiem's American Adventurer (P18). 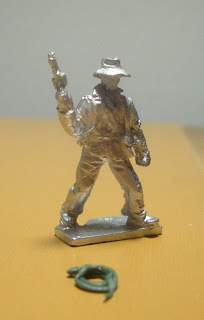 He holds a .45 revolver and machette, so I'd say he was based off of a Temple of Doom Indiana Jones. The machette is held rather awkwardly, and his neck looks too long, but it is otherwise not a bad sculpt. My only other criticisms are that the hat is more of an Akubra slouch hat than a fedora, and he does not have a whip. Next to the Elhiem figure, is a plastic version of Dr. Jones from the Indiana Jones Micro Machines Set by Galoob (74822) in 1/76. This is a Raiders of the Lost Ark version, complete with a tarantula on his back. 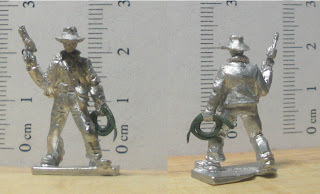 The final figure is a 15mm not-Indiana Jones from the Brigade Games Adventurers Pack (BG-G15MCP01). I like the way his hat is shaped, though the brim makes it look more like a boonie hat. He has a revolver and whip, but is wearing a duster instead of the iconic leather jacket. I decided that I liked the Brigade hat so much, that I did a head swap with the Elhiem figure. While I was at it, I also clipped off the machette so I could replace it with a whip. I bent his arm to a less awkward pose, and made a bullwhip from Kneadatite. I also filed down the collar of the jacket because it was just too high. I also adjusted the brim of his hat to give it a more proper look. 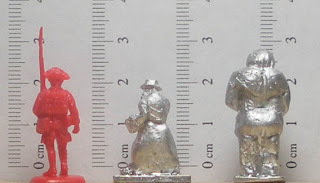 The next figures are the Rabbi and Clay Golem (P19). The rabbi wears a long kaftan, and a hat of some sort. 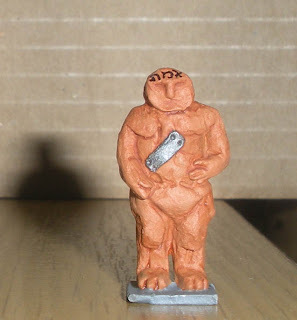 The golem miniature is based on the Golem of Prague which is typically depicted in a terracotta color, so that's how I painted it. The next group is a comparison of the Elhiem Octopoid Priest (P24) with a mind flayer and a not-mind flayer. 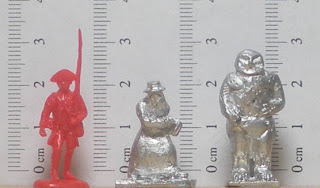 The tall fellow in black is a 25mm Mind Master from Grenadier's Subterranean Terrors boxed set (2012). I really like this miniature. The elongated head is more squid-like than a typical mind flayer, and tentacles protrude from under the robes suggesting that the creature is more than just a man with an octopus (or squid) for it's head. 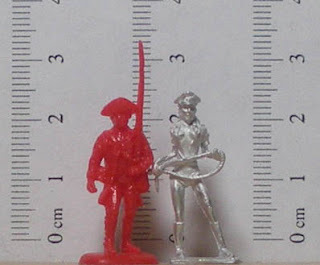 One of these days I'll have to create a 20mm version of it. Following the Mind Master, is the Octopoid Priest. It's head is covered with a lensed hood, and the figure comes with a separate tentacle for the right arm. It too, has a tentacle protruding from under it's robes. Very creepy. I think I'll graft a regular arm on the figure though, and convert it to a mind flayer. Last in line is a 15mm Mind Flayer from the Ral Partha AD&D Battlesystem line. 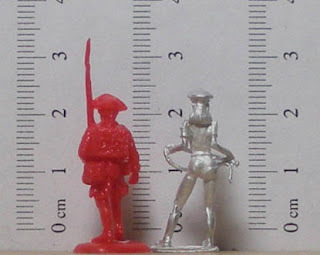 This particular figure came from a Chipco Evil Army set. It is a classic example of an old school mind flayer, and one of two 15mm mind flayers produced by Ral Partha. The next miniature is Elhiem's Cultist Leader (P24). He's a bit on the chunky side and the dagger he holds will need to be replaced. It is too small, and just looks like it's in the wrong position in reference to his hand. And last, but not least, is Mz Whip (P34). Nice.